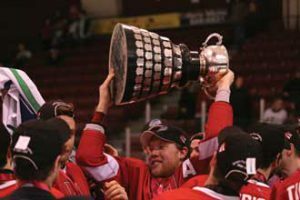 McGill’s varsity hockey squads experienced both ends of the competition spectrum last weekend, with the Redmen enjoying the thrill of victory in capturing the Ontario University Athletics Queen’s Cup, and the Martlets suffering the agony of defeat in the CIS women’s hockey championship final. The Redmen will now go on to compete for the CIS Cavendish University Cup championship, which runs March 25-28 in Thunder Bay, Ont. Andrew Wright of Toronto scored twice, including the winner as visiting McGill skated to a 3-1 triumph over Lakehead University in Thunder Bay, Saturday night. The win marked McGill’s second Queen’s Cup victory in three years after last winning the elusive trophy in 1946.
unassisted, at 6:09 of the first period, slamming her own rebound past McGill netminder Taylor Salisbury, a freshman from Surrey, B.C., who was saddled with her first loss in seven post-season games. Edmonton native Alana Cabana added an insurance marker at 18:49 of the middle stanza. She pounced on a rebound off the goalpost to beat a diving Salisbury, who had lost her stick on the play. The Pandas, who outshot McGill 24-18, were backstopped by the stellar goaltending of senior Dana Vinge of Edmonton throughout the championships. Vinge did not allow a goal against in three tournament games, tying the CIS tourney shutout record set by McGill’s Charline Labonté in 2008. “They came out really hard and pressured us and we haven’t seen that style all year so it took us a bit of time to adapt,” said Amey Doyle, interim head coach of the Martlets. The No. 1 seeded Martlets, competing in their fourth consecutive national championship final, came into the game riding an 86-game winning streak against CIS opponents. Their last loss, a 3-2 overtime shootout decision, occurred at the hands of the very same Pandas on Dec. 30, 2007. The Pandas also stopped McGill’s 20-game win streak in post-season play, dating back to Alberta’s 4-0 win in the 2007 CIS gold medal game. Despite the loss, the team continues to be an inspiration for the McGill community. Three seniors on the Martlets have played their last game in a McGill jersey: team captain Vanessa Davidson of Kirkland, Que., alternate captain Rebecca Martindale of Kingston, Ont., and forward Amy Soberano of Toronto. Davidson will graduate as McGill’s all-time leader in games played (203), goals (145), assists (158) and points (303). The Redmen, who posted an impressive 34-12-1 overall record this year, breaking the single-season school record for wins (33) set in 2007-08, when the team played one fewer contest, still have a chance to avenge the Martlets. Coach Jim Webster’s squad will enter the Nationals as the second-ranked team in the tournament. The University of Alberta Golden Bears, winners of the Canada West final, will be ranked first. The St. Mary’s Huskies, winners of the AUS title, will rank third, and play in Pool B with McGill and fifth-ranked Manitoba. Host Lakehead (4) and UQTR (6) will play in Pool A with Alberta. The CIS championship website can be found at http://english.cis-sic.ca/championships/mice/. Live webcasts of the games can be viewed at http://www.ssncanada.ca.